Movie Review: “Unexpected” is a drama of circumstances, set in an inner city of Chicago. It stars Cobie Smulders and Gain Bean, respectively as a high school teacher and student, who coincidentally find out they’re pregnant during critical phases of their lives. The third feature film from Kris Swanberg, wife of the film director Joe Swanberg (“Drinking Buddies”), is fictional, despite the filmmaker is living in Chicago and formerly had been a schoolteacher. The film starts with Sam (Smulders), reading online the top ten symptoms of pregnancy and the description for a job as coordinator in a museum. It’s not difficult to guess that she was pregnant indeed, and the museum was nothing less than her dream job, which she applied without high hopes. More difficult to guess was that one of her most liveliest and promising students, Jasmine (Bean), was also pregnant. Clearly, these women have different realities and options, and in both cases something in their actual lives has to be sacrificed for the sake of the new ones that are coming. Sam has all the support of her boyfriend, John (Anders Holm), and the couple doesn’t hide the happiness when they get married in secret; the only factor still in discussion is if Sam agrees on being a stay-at-home mother. In turn, Jasmine, carrying a tough past on her shoulders, breaks up with her immature boyfriend and ponders giving up college. A true friendship is established between Sam and Jasmine as they offer each other help and support while learning from their differences. 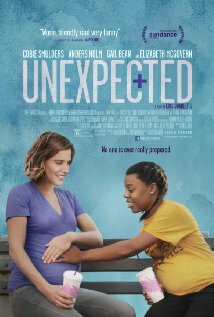 “Unexpected” is evenly loaded with realism and familiarity, which are the best and the worst in the film. The direction of Ms. Swanberg is earnest and avoids fluctuations, but the material, treated with indelible comfort, blocked my true emotions, reason why I never felt anxious or worried for the protagonists’ future. The most memorable scene, also nominated as the nastiest of the year, has to do with 'drinking' Cheetos.